The annual intensive three day weekend aviation safety seminar hosted by the Philadelphia FSDO took place in late March at the FAA Technical Center near Atlantic City. Philadelphia is the only FSDO to sponsor three day survival seminars. Event chairperson, Eileen Iandola of the Philadelphia FSDO opened the proceedings on the evening of Friday March 23rd by introducing her Safety Seminar mascot Shark Baby. 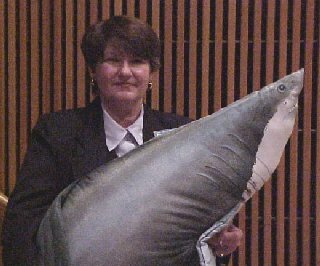 Iandola, holding her shark, brought a laugh from the audience when she said "
We're from the FAA and we're here to help you." The weekend's offerings started with an intensive exploration of the psychology of survival presented by Jim Spanyers of CAMI in Oklahoma City. Spanyers has been a regular featured presenter at the Atlantic City Survival Weekends. Starting on Friday night Larry Boshers of CAMI introduced pilots to the spatial disorientation simulator, demonstrations for interested pilots continued through out the weekend. 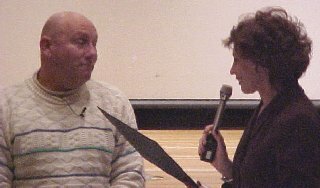 in recognition for his participation by Arlene Feldman, Eastern Region FAA Supervisor. Saturday morning's program focused on land survival skills. 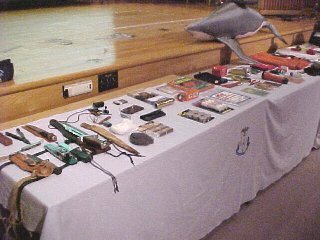 and signaling devices including a solar rechargeable flashlight. Survival of the over 100 attendees was not ignored as the New Jersey 99s were instrumental in seeing that lunch was available. Saturday afternoon included a thorough briefing at the Atlantic City Coast Guard Station, located on the airport. 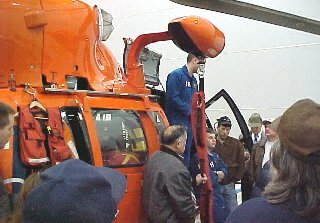 Attendees saw CG helicopters up close and had ample opportunity to question crew members. The major lesson learned was that if you are the object of a search and rescue, either on land or water, your major objective is to make yourself appear as big or as distinctive as possible. except into known icing conditions. 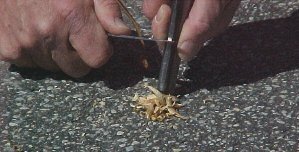 The Atlantic City seminars traditionally reserve Saturday afternoon for outdoor demonstrations. Near gale force winds and a downpour were no deterrent to the planned outdoor exercises. 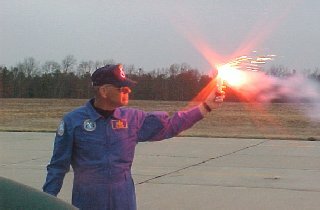 Many willing participants had their first opportunity to fire a flare. with a hand held flare, keeping it downwind from yourself. From the proceedings, one would suspect Spanyers has a love for pyrotechnics. 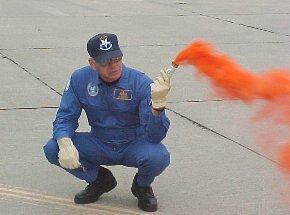 High winds demonstrated how a billowing smoke signal can be quickly dissipated. Sunday started with hands on demonstrations of fire starting by non-conventional means, using tinder ignited by flint and steel or by short circuiting steel wool across a 9 v. battery. It was cautioned that the battery and steel wool should always be carried in well separated packages. Flint and steel really does work to build a fire. Psychological factors influencing the making of good flying decisions was explained Dr. Ian Fries who emphasized that the presence of stress can limit the information an airman processes. He pointed out that denial of the real problem, until it is too late, can limit the options of a pilot who should be prepared to come to the realization when an emergency is actually in progress. Dr. Fries stressed the necessity to avoid what he called "magical thinking" it worked in the past, it should work this time. The current FAA point of emphasis, runway incursions, was given serious treatment with participants being given a brief quiz on airport signs. The answers were in another booklet available outside the auditorium. It is highly recommended that all current pilots obtain the current airport marking brochure which is published in color. It contains an informative airport marking quiz (as well as the answers). Sunday afternoon's program continued with an update on the wings program and a presentation by the Milville Flight Service Station on how flight planning assists in search and rescue. A film on crash impact survival featuring General Spruance of the Delaware Air Guard concluded this year's program. Participants who attended the entire three day session will be awarded a certificate of attendance as well as renewed eligibility for the Wings Program.